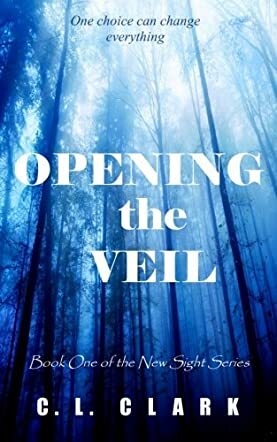 Opening the Veil is the first book in the New Sight series written by C.L. Clark. Cass adores her cat. Since Cass found Allie in an alley way (thus, her name) as a tiny kitten, Cass and Allie have had a very close and loyal bond. Like all cat lovers, Cass talks to her cat, imagining what Allie would say in return. At the insurance company where Cass works, her boss (Artie) quietly tells her that the company is investigating Todd, the only employee that she loathes. Meanwhile, handsome and charming new neighbor, Scott, moves in. At Scott’s request, Cass goes to dinner, only to watch him shamelessly flirt with the beautiful and bubbly waitress for the evening. After dinner, Cass hears Allie going berserk inside the apartment and crying loudly as Scott kisses her, thus bringing the kiss to an abrupt end. That night, Allie wakes Cass and communicates telepathically with her, warning Cass to stay away from Scott. Cass gets out of bed for some air and sees Scott staggering home, covered in dirt. The next day, Cass is shocked to see the flirtatious waitress’ face in the news headlines as the latest victim in a spate of murders. With two men now acting suspiciously, Cass decides to investigate the murders with Allie by her side. Cass is fast running out of time to find out who the killer is before he strikes again, and is forced to use every single skill she can call on to ensure she is not the killer’s next victim. As a cat lover, I could not help but absolutely fall in love with this book. C.L. Clark has created a murder mystery filled with intrigue and a whole lot of laughs in an intense whodunit thriller. The interaction between Cass and Allie not only caused me to roll my eyes, but also made me laugh out loud due to the fact that I do the very same thing with my cats. Opening the Veil starts as a mild investigation into a co-worker who is bending the rules, before the story quickly takes the path of an adrenaline-pumping, action-packed thriller which keeps you on the edge of your seat with each new page. The supernatural addition of Allie being able to telepathically communicate with her human was a real treat, and the humor which ensued was well received. Whether you are a fan of people and their pets, of sleuthing mysteries, or of action and adventure, this book will be sure to keep you hooked right up until the very end.